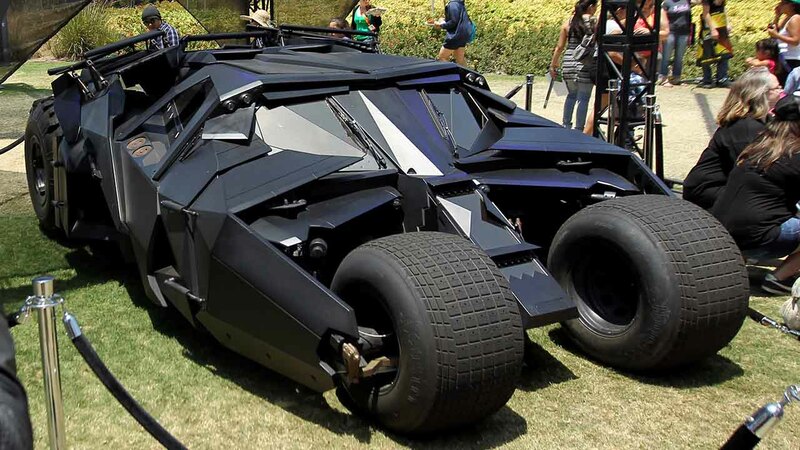 A Tumbler Batmobile from "Batman Begins", "The Dark Knight", and "The Dark Knight Rises" is seen during Comic-Con, Saturday, July 14, 2012, in San Diego. As if a wardrobe full of "Batman" t-shirts weren't enough, a dad and son are showing off their super-fan status with a stroller inspired by the Tumbler Batmobile from Christopher Nolan's "Dark Knight" trilogy. Tap to see video if viewing on News app. The video above is the most recent episode of the web series "Super-Fan Builds," which showcases master prop maker Tim Baker as he builds one-of-a kind collectibles for super-fans. When Maressa Earl nominated her husband Josh as the ultimate "Batman" super-fan, the team decided on a project the whole family could appreciate. While the custom Batmobile may not be the most practical choice for busy parents, it's hard to argue with the cool factor. You can practically hear the engines roaring as Josh pushes his son Collin along. If "Batman" isn't quite your thing, check out this other video from "Super-Fan Builds," where they build a Groot swing for a family of "Guardians of the Galaxy" fans.